The windshield wipers and washers can be used when the ignition switch is in ON *1. Move the lever up or down to change the wiper settings. 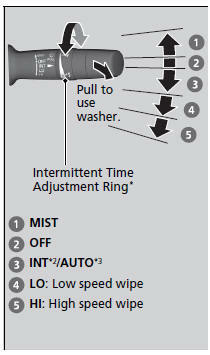 Turn the adjustment ring to adjust the wiper operation. When you release the lever for more than one second, the spray stops, the wipers sweep two or three more times to clear the windshield, then stop. In cold weather, the blades may freeze to the windshield. If the vehicle speeds up while the wipers are operating intermittently, the length of the wipe interval shortens. When the vehicle speeds up, the wiper operation’s shortest delay setting ( ) and the LO setting become the same. The wiper motor may stop motor operation temporarily to prevent an overload. Wiper operation will return to normal within a few minutes, once the circuit has returned to normal. Rotate the wiper switch to OFF, and turn the ignition switch to ACCESSORY or LOCK 0*1, then remove the obstacle.